The pledge campaign has also shown that we have a global audience as well as contacts in London and New York, and the money should help us to interact with those audiences. Shininglights has been talking to artists about the interaction between music and money. The aim is to understand how different artists approach this and how individuals can apply this to their own circumstances (whether as a musician or any other profession). In this interview we talk duo Misterminchie and Jamie Jamal (“This Human Condition”). 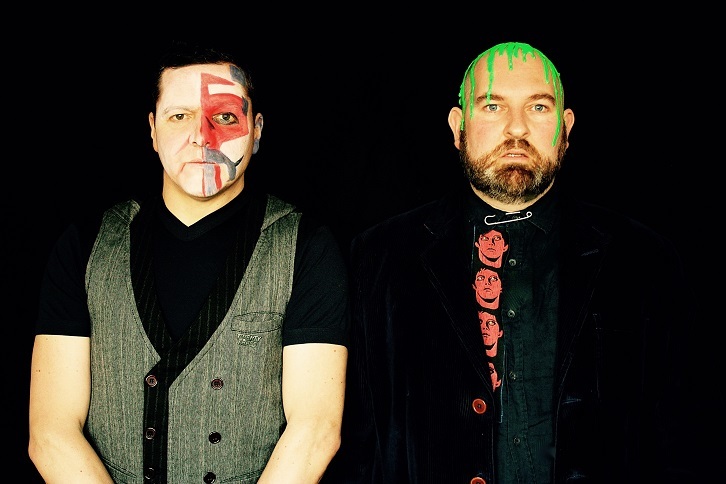 “This Human Condition” are a synth pop outfit from Bristol, formed in January 2015. They self-released an EP, “Rise”, in 2015, and are about to release their debut album via a crowdfunding campaign (Pledge Music). We caught up with Misterminchie and Jamie to understand how they have approached this. THC: We first met in 2010 when we were introduced through a mutual friend. At the time Jason (Misterminchie) ran (and still runs) the Bristol Songwriters Circle and was busy writing and collaborating with other artists. With Jamie already involved with other bands (“Love Jam”, “Diamond Dust” and “Suspension”) the time wasn’t right and nothing came from this. In 2012 we met again at a time when Jamie was looking for a new challenge and Jason was looking to put a band together (but had been waiting for the right person to come along). Jamie & Minchie had a bunch of songs and Minchie had the production skills needed to develop these. We quickly found we had a shared love of music (“particularly Zingalamanduni by Arrested Development”) and it just felt a natural fit. From about 2013 onwards we started working together, initially with Jason doing production work on a track called “I Know Pain” which appears on our debut EP, and then working together on our first track for the Rugby World Cup Album. Things started to develop from there as we played more open mic evenings and started to develop both our sound and image. In 2015, with the songs we had, we produced our debut EP, working with Paul Whitrow. 2016 is the next stage, with our debut album “Project Zero” due out in March. We have part funded this ourselves but also we ran a successful pledge music campaign and have used profits from the sales of the EP. THC: We’re usually inspired by the avant guard. A friend has described our style as “handbag punk”, which we like!… “Early Depeche Mode” meets “Erasure”. Interestingly we felt we were more “John Grant” meets “FKA Twigs”! We don’t want to stick to one genre but focus on delivering excellent quality music. Perhaps we might label ourselves as “mind bending electro”, but with such a diverse mix of music (the MP3 generation), people will make their own mind up. Mutual influences include the likes of “Prince”, “FKA Twigs” and “John Grant”. Jamie is influenced by anything from Karlheinz Stockhausen to New Wave and Synth Pop and artists including “Boy George”, “David Bowie”, “Bjork”, “Portishead” and “Massive Attack”. All of this flows into the sound we produce. But it is not just musical artists who influence us. The likes of Klaus Nomi and Leigh Bowery are really important from an image and style view point. Image is very important when producing an album. It is not just about the music it is also about the cover; the two are effectively entwined. It also goes further with “Psychotropic” (which is on the EP). We have a choreographed stage performance which draws out the story (which is about an individual with learning disabilities and psychosis who is scared of ghosts). We are not the first to do this and we take this from the likes of “Boy George” and “David Bowie”. THC: Things change really quickly and everything is instant. For example, Jamie added a new track, “Breaking The Code”, to Soundcloud and within a few days it had received over 350 views with no promotion. In the past it took much longer for word to get round and develop as an artist, now it is more instant and you need to be ready for that. The likes of “Pink Floyd” have been able to enjoy that development. It is not a bad thing because it is evolving. The challenge is that where in the past, people would invest their time in the artist, they are now quicker to move on so you need to constantly think of ways of engaging with your audience. THC: The simple answer is yes and we have a plan to do this. Jamie has gone part-time although he is fortunate that his partner supports him in this venture. And his work allows overtime. Essentially it is all about moving a hobby into a full-time business but without having to compromise artistically. The trigger would be more and more people engaging with our music and understanding the messages we are giving. If the money is there and the support, then this would give us the confidence to make the move. THC: Some of the challenges include the promotion and marketing but also giving up on the security of the jobs we have. We are working with a Record Label in New York (“Teknofonic”) who put together the digital side of our music. It is a new way of working with a label with a 12-month contract with full control over our music and direction. We feel they are on the same journey as us and plan to meet them in May to see how we can move forward. We are also looking to take on a promoter in the UK. Jason has a background in small businesses and this does help with the promotion and marketing side but we are limited in what we can do alongside our jobs. On the flipside it is the jobs that enable us to do what we do and it is just about getting to a point where we feel we can take that step. We are not there yet but hope to be in the future. THC: We started a Pledge Music campaign and raised 100% of the target quickly. We also used our own money to get the tracks mastered professionally and to produce a small number of physical CDs which are almost sold out. “Teknofonic” weren’t involved at this stage but have helped with getting the EP out to digital platforms across the world. THC: We have a relatively small target and have raised 188% of the target to date. We also plan to part fund ourselves and profits from the EP will also go into the pot. The money will be used to produce a high quality product through the use of an experienced mastering professional with decent equipment. We are also looking at the marketing side and are meeting “Teknofonic” in May to see how they can help. This side is difficult and it is early days. We don’t know everything but we are learning as we go along. We are finding that going out and talking to people helps and also doing interviews. THC: We have approached the ‘business’ side by engaging with as many people as possible. When we set up the band we merged our two groups of followers which has given us a healthy audience including “Boy George”. We have also looked at followers of artists we like and targeted them as we feel there is natural synergy. Jamie looks after the social media side of things. Pledge Music is also really important because people enjoy being part of a bands development. They can have personal experiences with the band and we find it is a great way to engage with our audience. Another area we are exploring is licencing, which can be a lucrative side to music. THC: We have applied for lots of festivals but equally we have focused on those where we see the right audience. The album is all consuming and the focus has been on that rather than performing. That will shift once the album is out. Each song contains a story, from mental health and transgender to climate change, and we want people to be able to engage with our songs. It is therefore about finding the right places and audiences to take them on this journey. THC: We would like to be making money from our music, touring, playing festivals and focusing on our sound and evolving our craft. We would like to collaborate with artists we respect. For us, it should always be about the music. THC: Bristol wise, places like the Fleece, Canteen and the Louisiana are fantastic venues, especially the Louisiana for sound. In the future we would like to play interesting venues including The Cube Cinema, Electric Ballroom, Festival Number 6, Red Rocks and of course Glastonbury. We would also like to go to some of the festivals in Iceland and play in beautiful buildings such as the Union Chapel, Alexandra Palace and St Georges hall. What I find interesting is how far the band has developed in a relatively short period of time, especially with the release of both an EP and Album. Clearly both Jamie and Jason have a plan and they are finding their feet as they go along. Talking to them about Pledge Music, they have set a target that they feel can be achieved and effectively used this as part of the overall funding package. Furthermore, they are not afraid to try things, especially with the link with the record label and all of this, shows their vision to try anything in the path towards success. Listening to the EP you can hear the influences especially from “Depeche Mode”, but equally you are drawn into listening to the stories behind the songs. If you watch their videos, taking “Psychotropic” as an example, the imagery is all important. There is no easy path in music and certainly they have a distinctive sound which will appeal. As they freely admit it is more likely to appeal to a BBC Radio 6 audience and they have already had some success with this. It will be interesting to see how they develop especially with the release of the album and link with the record label in New York. Hopefully they will be touring in Bristol and I can enjoy the full effect of their musical show.